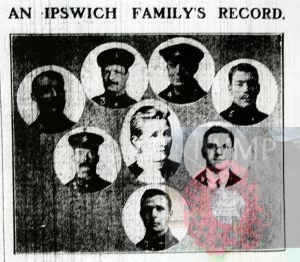 image from 1918 Suffolk Chronical and Mercury newspaper. Died: 6th November 1917; age 38; KiA. Regiment: Devonshire Regiment, 1st Battalion. Relatives Notified & Address: Son of Susannah Brunning, of 48, Wykes Bishop Street, Ipswich. 1881 Upper Orwell Courts, Ipswich. James was 6 months old and living with his parents & siblings. David Nathan Brunning, 34, a Fish Hawker, born Ipswich. Susannah M. Brunning (nee Payne), 30, born Ipswich. Susannah Miriam Brunning, 8, born Ipswich. David James Brunning, 6, born Ipswich. Abraham Mason Brunning, 4, born Ipswich. Mary Ann Brunning, 2, born Ipswich. James was 10 years old and living with his parents & siblings. David, 43, a Quay Labourer. Susannah, 18, a Stay Maker. Abraham, 14, a Gate Porter – Foundry. George William Brunning, 8, born Ipswich. Abigail Louisa Brunning, 6, born Ipswich. Walter Brunning, 2, born Ipswich. Alice Brunning, 3 months, born Ipswich. 1911 22, Union Street, Ipswich. James was 30 years old, a Labourer – Iron Foundry. He was living with his widowed mother & sister & nephew. Louisa, 19, a Boot Machinist. William Henry Foulgar, 15, a Moulder – Iron Foundry, born Ipswich. James’s father David Nathan Brunning, died 1912, Ipswich. The above are the four sons, two grandsons, and son-in-law of Mrs. Brunning, 48, Wykes Bishop Street, Ipswich. Their names and regiments are: (1) Pte. D. Brunning, A.S.C., now attached R.E., formerly at Orwell Works; (2) Pte. A. Brunning, Suffolks, has won the Military Medal for rescuing his Sergt.-Major, been buried, now invalided home; (3) Pte. J. Brunning, 11th Hussars, was called up in 1914, but was sent home for illness. Now in France again, formerly at Orwell Works; (4) Pte. G. Brunning, Suffolks, went to France in 1914, was wounded in 1915, is now back in France, also at the Orwell Works; (5) Pte. W. Foulger (grandson), Suffolks, went to France in 1914, wounded in 1915, now at Halton Park, also at the Orwell Works; (6) Pte. 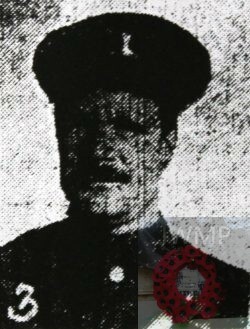 G. Fisher (grandson), Middlesex Regiment, killed in action on July 1st 1916, leaves a widow and three children; (7) Pte. S. Mee, joined up when war broke out, and is now on munitions, formerly employed at Messrs. E.R. and F. Turner’s.